NEW: Folks Singing – Tuesdays in term time, 1pm-2.15pm, St. Mark’s Church. 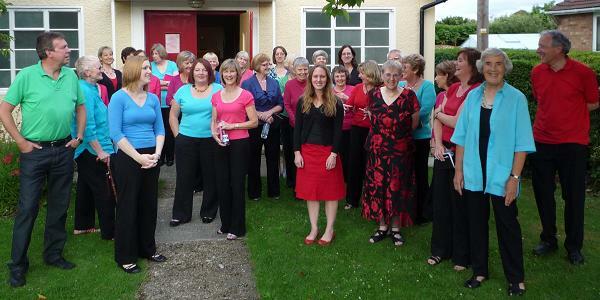 Sing Winchester is a world music choir which started in January 2009. We sing songs from many different countries, usually in 3 or 4-part harmony, with just voices (no instruments) in their original languages. There are around 25 people in the group. Jac, who runs the choir, has always enjoyed arranging music and singing in groups. She developed a love of harmony singing from an early age when she couldn’t reach the high notes that other people were singing, so had to improvise a lower harmony line! She studied the piano, joined a cappella and gospel choirs at University, then went on help lead them. 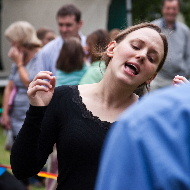 Her particular love of world music came from joining Woven Chords singing group in Stamford in 2002. They sang songs in a diverse range of styles, often with unusual harmonies, from many different parts of the world. The combination of the exciting music and the sheer power and beauty of singing with a large group was inspirational, and shortly after moving to the area, she started Sing Winchester in the hope of finding others who enjoyed the same range of songs. The aim of Sing Winchester is to bring the joy of singing world music songs to anyone who wants to join in – beginners, seasoned choir goers, men, women, all ages (16+) and all abilities. The atmosphere is light-hearted, friendly and very productive! Where, what time and how much? Rehearsals are in St Mark’s Church, Oliver’s Battery Road South, Winchester, SO22 4EU. 7.15pm – 9.00pm Fridays in term time. £6.00 per week if paid weekly and a discounted rate of £5.00 per week if the term is paid for in advance. A session starts with some gentle physical and vocal warm ups which are done together as a group. Songs are taught by ear, which means listening and then repeating back small sections of a song at a time until it’s learnt. There is no need to read music or to have any formal musical experience. Lyrics are given out with phonetic pronunciations for most songs, so there is also no need to be able to speak multiple languages! We are taking on new members. Contact Jac if you would like to join or have any questions.